We adopt a complete streets approach to include safe access for all users including pedestrians, cyclists, motorists and transit riders of all ages and abilities; create and sustain complete communities where residents can live, work and play in safe neighbourhoods; support accessible transit and alternative transportation to single vehicle occupancy vehicles; foster a sustainable urban form; and enhance programs to increase environmental awareness and stewardship. Public transit is an essential town service that helps people travel to work and school, participate in recreational and cultural programs and events, and stay connected with the community. Public transit is generally a more economical choice and is better for the environment than traveling by car. From an environmental perspective, public transit reduces the number of cars on the road improving air quality and lowering greenhouse gas emissions. Effective public transit systems are regarded as an important asset to reduce greenhouse gas emissions in the transportation sector and help communities achieves greenhouse gas reductions targets. Reporting ridership tells us how many people are using Oakville’s public transit system. In 2016, annual ridership reached 2.9 million trips which equals an average of 15 trips per Oakville resident. 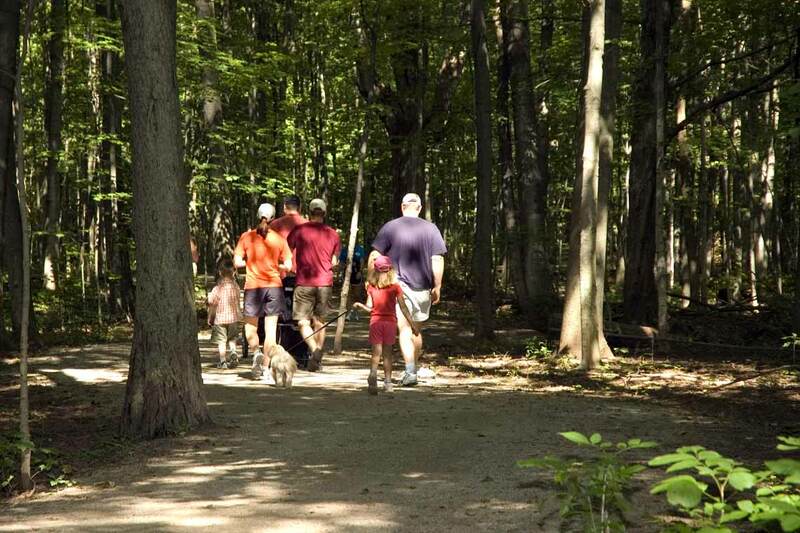 Oakville’s recreational trail system is an important asset that helps residents and visitors connect with the outdoors, stay active, and engage with the natural environment. Studies overwhelmingly indicate that access to nature contributes to physical and mental wellbeing and overall health. Oakville has one of the most extensive trail systems in Southern Ontario. Frequent additions of trail infrastructure have expanded trail availability contributing to an exceptional trail system throughout the town. In 2016, the town maintained 220.3 kilometres of recreational trails. A new standardized method for measuring recreational trails began with 2016 data and will be reported on annually. The ecological footprint is a sustainability accounting tool that measures the environmental impact of human consumption. Oakville’s ecological footprint accounts for household consumption of food, transportation, housing, goods and services, and government services and expresses the findings in terms of the land area needed to support that level of consumption in global hectares (gha) per person. The footprint is an approximation and depends on a number of different data sources to provide an overall number. 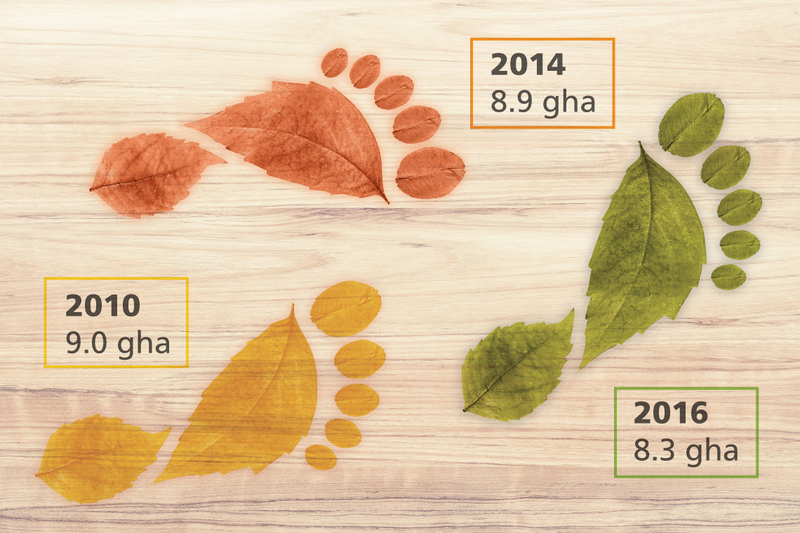 The ecological footprint for Oakville has shown incremental decreases since it was first calculated in 2010 at 9.0 gha. In 2014, this dropped to 8.9 gha and in 2016, 8.3 gha. The town periodically calculates the footprint to the neighbourhood level which has ranged from a low of 5.2 gha to a high of 15.2 gha per capita. Minimizing our ecological footprint requires a community wide effort to lead more sustainable lifestyles. Active transportation refers to any form of human-powered transportation — walking, cycling, in-line skating or skateboarding. Choosing active transportation instead of driving reduces air pollution, greenhouse gas emissions and congestion. In addition, active forms of transportation provide exercise and are positively correlated with a stronger sense of community belonging. Research also shows pedestrian and cycling friendly streetscapes support local businesses. Oakville has 200.6 kilometres of active transportation routes. In addition to expanding the network of routes, the town has invested in supporting cycling infrastructure. For example, since adoption of the Active Transportation Master Plan (ATMP) in 2009, the town has installed over 200 bike racks in the business improvement areas. In 2017, Oakville completed an update of the ATMP to support a pedestrian and cycling supportive community that encourages active ways to get around for both commuter and recreational travel.